Researchers at Northwestern University have revealed some of the mechanical properties that allow fish to perform their complex movements. 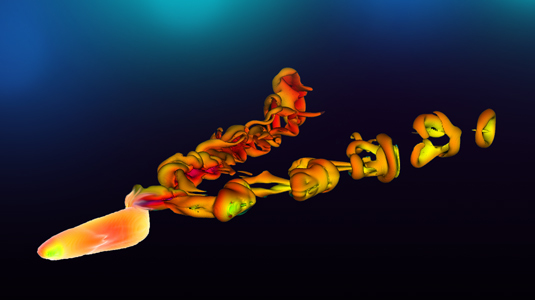 Their findings, published on June 13 in the journal PLOS Computational Biology, could provide insights in evolutionary biology and lead to an understanding of the neural control of movement and development of bio-inspired underwater vehicles. The researchers used computational methods to test assumptions about the preferred evolutionary characteristics. For example, species with low muscle activation frequency and high body stiffness are the most successful; the researchers found the optimal values for each property. “The stiffness that we predict for good swimming characteristics is, in fact, the same as the experimentally determined stiffness of undulatory swimmers with a backbone,” said Amneet Bhalla, graduate student in mechanical engineering at McCormick and one of the paper’s authors. In addition, species must be resilient to small changes in physical characteristics from one generation to the next. The researchers confirmed that the ability to swim, while dependent upon mechanical parameters, is not sensitive to minor generational changes; as long as the body stiffness is above a certain value, the ability to swim quickly is insensitive to the value of the stiffness, the researchers found. Finally, making a connection to the neural control of movement, the researchers analyzed the curvature of its undulations to determine if it was the result of a single bending torque, or if precise bending torques were necessary at every point along its body. They learned that a simple movement pattern gives rise to the complicated-looking deformation. “This suggests that the animal does not need precise control of its movements,” Patankar said. To make these determinations, the researchers applied a common physics concept known as “spring mass damper” — a model, applied to everything from car suspension to Slinkies, that determines movement in systems that are losing energy — to the body of the fish. This novel approach for the first time unified the concepts of active and passive swimming — swimming in which forcing comes from within the fish (active) or from the surrounding water (passive) — by calculating the conditions necessary for the fish to swim both actively and passively. The paper, “A Forced Damped Oscillation Framework for Undulatory Swimming Provides New Insights into How Propulsion Arises in Active and Passive Swimming,” was authored by Patankar, Bhalla, and Boyce E. Griffith, assistant professor of medicine and mathematics at New York University. The work was supported by the National Science Foundation (NSF).